Some clients truly need to invoke the rule-setting and enforcement capabilities of the judicial system. With more than 20 years of courtroom experience, Curtis is very comfortable advocating in front of a judge or jury on behalf of his clients. However, Curtis also recognizes the collateral harm caused by a judicial system that was never designed to resolve family disputes. His goal is to help clients resolve their conflicts constructively, so they can move forward with hope for a better future. Curtis practices family law as he lives: with honesty and integrity, working diligently to make a positive difference. Whether he is advocating for business owners, professionals, or full-time parents, Curtis does his best work for clients seeking an ethical and strategic approach to resolve their family law issues. With a background in business and litigation, Curtis is skilled in managing high asset and complex financial and business valuation matters. Curtis also has experience dealing with the dynamics of high-conflict personalities and certain personality disorders in divorce, including antisocial personalities, narcissistic personalities, and individuals with borderline personality traits. He is particularly experienced in helping spouses who have been in manipulative or abusive relationships separate themselves from those relationships. Curtis currently serves as the Managing Partner at GoransonBain Ausley. He is Board Certified in Family Law by the Texas Board of Legal Specialization and has been named as a “Texas Super Lawyer” by Thomson Reuters every year since 2008. He has also been named a “Best Lawyer” by U.S. News —Best Lawyers in America© in the fields of Family Law and Collaborative Law in 2017-2018, and he currently serves on the Texas Board of Legal Specialization Family Law Advisory Commission. 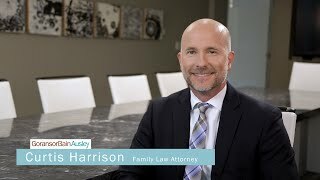 KDFW Fox 4 – Good Day TV segment, titled, “Modern Divorce Trends,” featured an interview with attorney Curtis Harrison about co-parenting, how the emotion aspects of divorce affect one’s logical thinking and decision-making, and knowing your attorney’s approach and style.